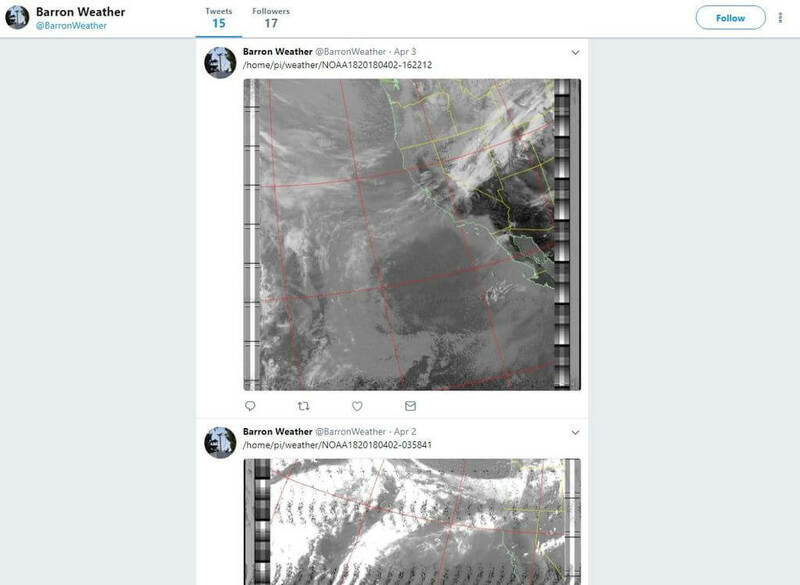 Over on Reddit we've seen an interesting post by "mrthenarwhal" who describes to us his NOAA weather satellite receiving system that automatically uploads decoded images to a Twitter account. The set up consists of a Raspberry Pi with RTL-SDR dongle, a 137 MHz tuned QFH antenna and some scripts. The software is based on the set up from this excellent tutorial, which creates scripts and a crontab entry that automatically activates whenever a NOAA weather satellite passes overhead. Once running, the script activates the RTL-SDR and APT decoder which creates the weather satellite image. He then uses some of his owns scripts in Twython which automatically posts the images to a Twitter account. His Twython scripts as well as a readme file that shows how to use them can be found in his Google Drive. mrthenarwhal AKA @BarronWeather's twitter feed with automatically uploaded NOAA weather satellite images. I followed the instructions on the instructables webpage but rtl_test is failing and thus also my captures. This is a great tutorial. Thank you for showing this! This is the reason why I love this page since years! I vote for heatmaps. There was some tutorials for heatmaps and wide spectrum panorama but those were way too hard for me..
Yep. I’d love to get my daily heatmaps. Hmmm. Maybe I could do a simple tut for that! ?